The Bounty of Harvest Season! Crops on a farm can be bountiful or spare year to year, depending on the vagaries of temperature, soil, moisture and the fluctuation of animal and bird populations that may do them harm. 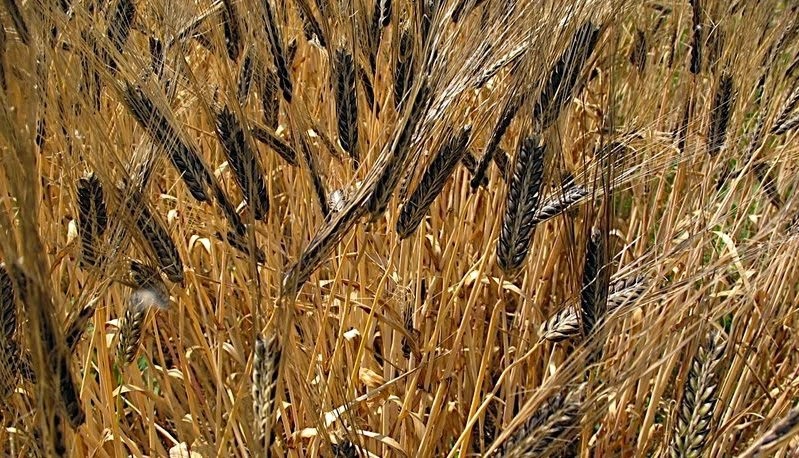 This year was a good year for barley, and here contributor Anthony Boutard of Ayers Creek Farm expounds upon this grain. 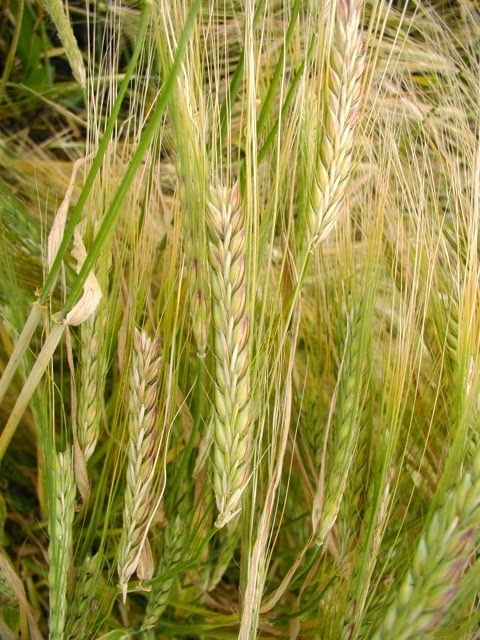 Barley, Hordeum vulgare, is the small grain with the greatest diversity. There is a wide range of kernel colors, including white, tan, brown, blue, purple and black. There are varieties with two and six rows of kernels, and some indecisive sorts with four rows. There are varieties that have an indigestible hull adhered to the kernel and those that thresh free of the hull, termed naked or hulless. The types that retain their hulls are typically used for brewing and animal feed, though they can be pearled, which removes the hull and parts of the aleurone and the germ as well. The presence of the hull reduces bloat in draft animals and is essential to the malting process where it prevents the germinating grains from overheating. The hulless trait is controlled by a single gene and means humans can eat the whole grain. 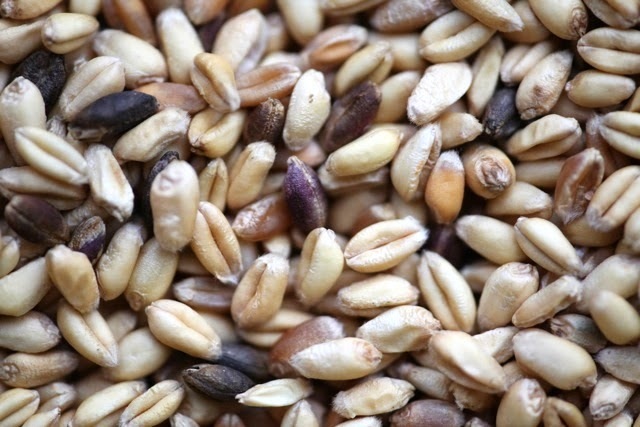 The hulless varieties are more nutritious because the whole grain is edible and retained. 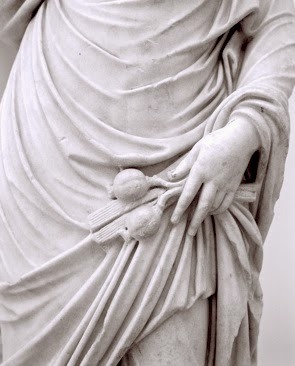 Ceres holds barley and poppies. In the sometimes silly race to promote "ancient grains," barley is considered too prosaic to earn a mention. However, even 2,000 or so years ago, Pliny described it in the superlative as antiquissimum frumentum, or the oldest of the cereals. That's old, folks. And, no, we are not going to claim that any of our seeds were pulled from a tomb or old pot buried somewhere. Crop seeds are a living legacy of civilization, and are generally viable for no more than a decade at best. Barley was sometimes assigned the status as a sacred grain and it is the grain Demeter holds along with a poppy capsule in the classic renditions of the goddess. We started working with hulless barleys over 10 years ago and have offered it off and on through the decade. There is a cluster of naked barley devotees out there, people such as Will Bonsall of Industry, Maine, and Anpetu Oihankesni of Hotchkiss, Colorado, who provided much of our collection. They have varieties from around the globe, and we combed their collections for varieties with notable flavor. Keeping all the varieties separate became too much work for a farm at our scale. So last year we took all of our varieties, mixed them up and planted them together in a single plot. A sacrilege of sorts, but otherwise hulless barley culture at Ayers Creek was doomed as an erratic and meagre offering. This week we will bring in the mix, a classic American melting pot of barley instead of humans. You will see the blue kernels from the Arabian variety, the large brown seeds of 'Dolma' that was collected in Kinnaur, India by Oihankesni, the white kernels of two Italian varieties from Bonsall, the tiny, rice-like kernels from the Korean 'Kamet-mugi' and the Japanese 'Sangatsuga'. The black kernels are from a variety of uncertain origin called 'Jet' that we acquired from Bountiful Gardens. We soak the barley overnight, refresh the water, bring it to a full boil and simmer it until until tender, about 40 minutes or so. Use barley as you would rice. Make pilafs, add it to soups, make grain and vegetable salads. 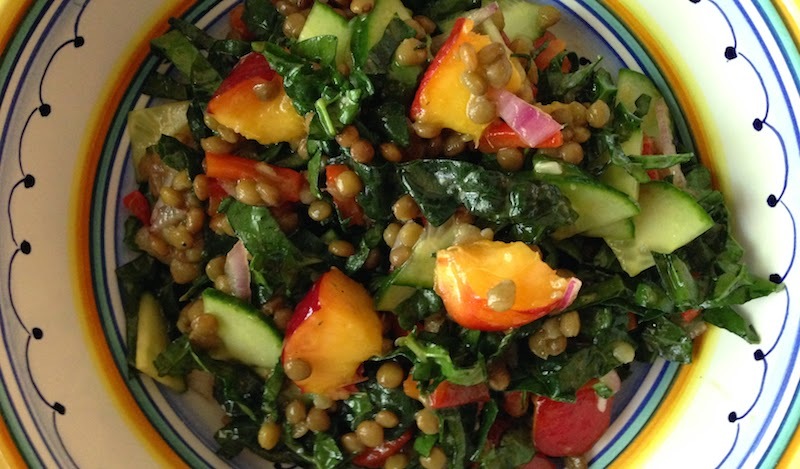 It is flavorful, nutritious and pretty. That is the fine package that attracted us to the grain in the first place. 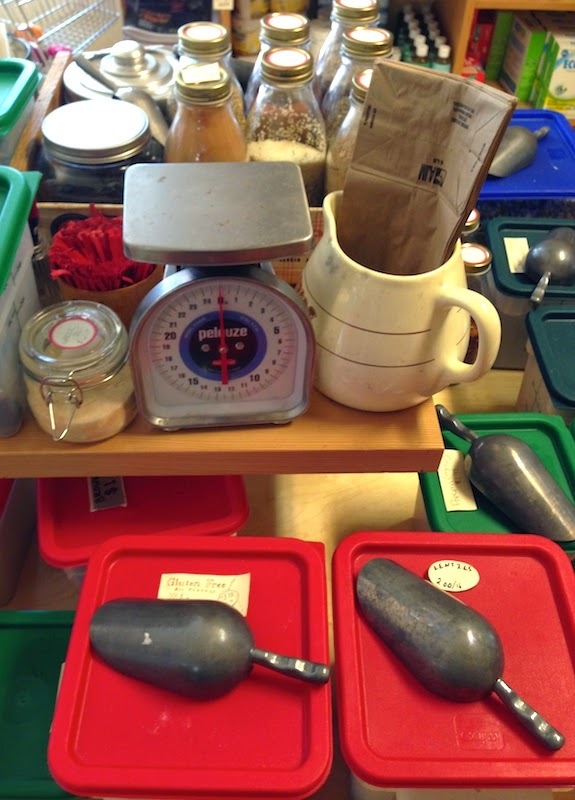 And perhaps we can be forgiven for the sin of mixing the various types because it is an attractive collection. I can hear my mother's words echoing in my head: "This is because your eyes were bigger than your stomach." It all started innocently enough, when Dave and I drove out to Ayers Creek Farm to pick some of the Astiana tomatoes that, for the last few years, we've roasted and frozen to use throughout the winter in soups, sauces and, yes, even cocktails. 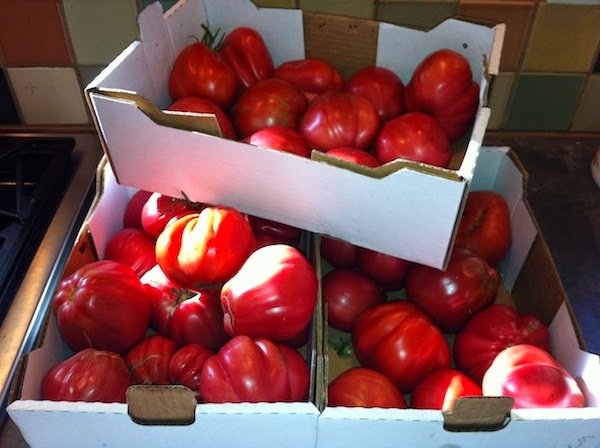 The first year we bought a total of 50 pounds of the blood-red, heart-shaped tomatoes that Anthony and Carol brought from Italy as seed and adapted to the climate of the Wapato Valley. 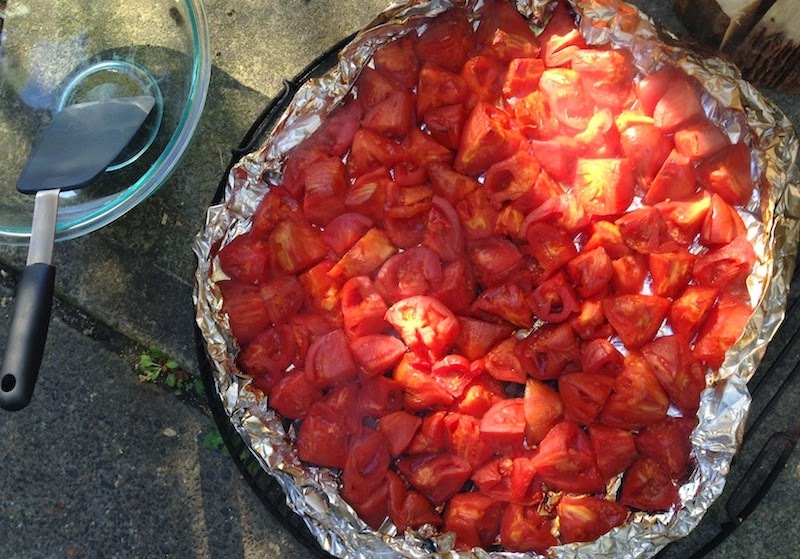 (Read the very entertaining story of their discovery of these tomatoes.) The next year it was 80 pounds, then 120 pounds, and this year I figured we needed 150 pounds to take us all the way to the next season. Roughly chopped, ready for roasting. 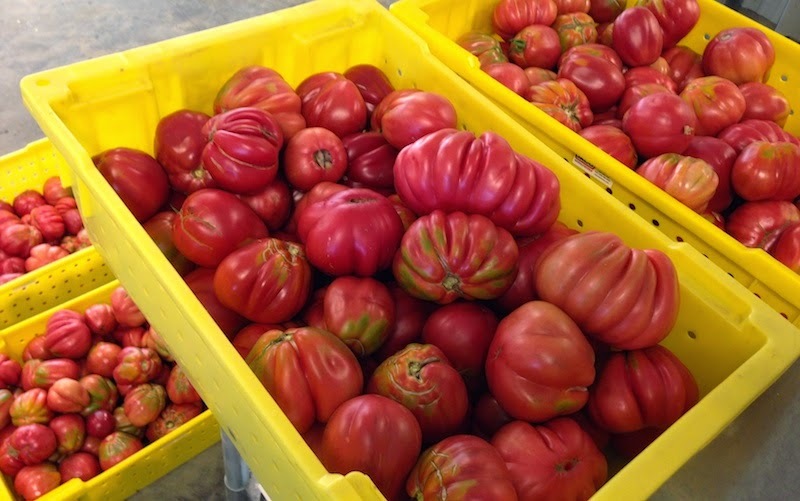 Named Astiana after the town in the Piedmont region of Italy where they originated, these large tomatoes are almost all flesh with very few seeds, ideal for making sauce and paste. My plan was to get a jump start on the processing by bringing home 50 pounds or so, then getting two more batches of 50 pounds each as the season, about a month long, progressed. I say "was" because when we got to the field and started picking, using the four yellow crates that Carol insisted we would need—you can tell I'm trying to shuffle off blame here, right?—well, that's when my clever plan went a bit sideways. By which I mean completely off the rails. After roasting, ready to bag and freeze. Hauling the crates back to the processing shed, we knew we had more than 50 pounds-worth staring back at us, but when it was all weighed and bagged, that's when I heard my mother's voice. It turns out there were 142 pounds of my favorite fruit sitting on the table in that shed, 142 pounds that were subsequently driven home and the same 142 pounds carried into the house. To say I saw my life, or at least the next few days of my life, flash before my eyes might be a wee bit of an overstatement, but there was definitely an "Oh my god what have I gotten myself into" feeling at surveying the bags and bags (and bags…) of ripening tomatoes at my feet. Fortunately they were at varying stages, from squishy, do-something-with-them-right-now-or-say-sayonara ripeness to barely pink-almost-green ones that, with luck, would take three or four days to get fully ripe. Sorting through them and labeling bags "soon" for those needing attention in the next day or two and "hold" for those that could wait a couple of days, we dove in and grilled two batches of the softest ones that evening, which went immediately into the freezer. We hope to have the rest done by Sunday, divided more or less evenly between grilled and oven-roasted. Wish us luck! I've heard it mentioned more than once now, the four letter word starting with F that gets bandied about this time of year. You know the one: fall, aka autumn, the precursor to winter. I mean, we're still looking at temperatures in the 90s this week, for Pete's sake. Yes, I know, school's starting soon, August is giving way to September, blah, blah, blah. But we live in the Northwest, where the rains can hold off until October or November in a good year. And with Indian summer there's the possibility of camping, picnics and outdoor gatherings for another several weeks. So I'm putting my hands over my ears, living in denial and ignoring pooh-poohers who want to harsh my summer mellow. I'll be wearing my Keens and capris, eating as many tomatoes as I can stuff into my face, enjoying whatever Dave pours out of his cocktail shaker or pulls out of the smoker (like the 11-hour brisket, above), plus making my mom's classic potato salad that makes any time of year feel like the height of summer. So there! Put unpeeled potatoes in a large saucepan or Dutch oven and cover with water. Place on stove and bring to a boil. Cook until potatoes are tender but not mushy. Drain and cool (can be made ahead). While potatoes cook, make dressing. Put all ingredients in a bowl and stir to combine. Peel potatoes (optional), then slice cooled potatoes into 1" square and 1/8" wide pieces (or bite-sized). Chop onion and pickles fine. Chop eggs. Put them all in a large bowl, pour dressing over top and fold it in until thoroughly combined (don't stir or the potatoes will break up too much). 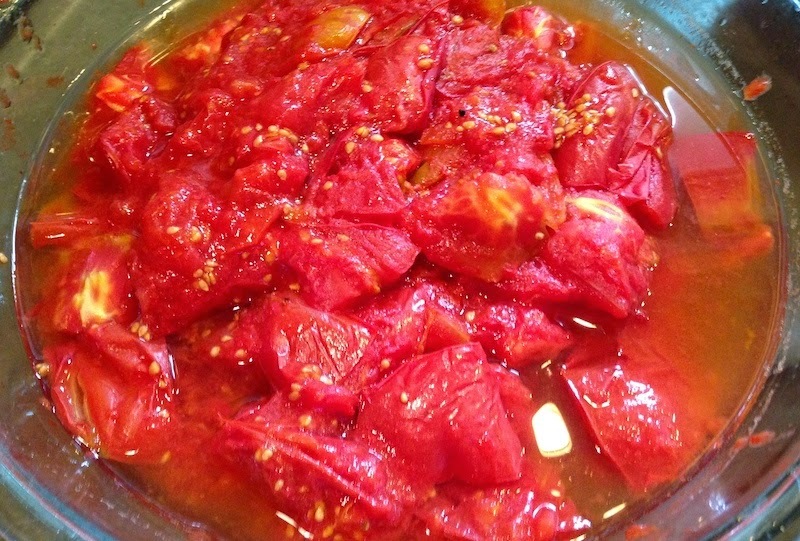 Place bowl in refrigerator and let sit for a couple of hours so flavors have a chance to mingle. Serves 10-12. This recipe makes a huge batch, so feel free to halve it, though it tastes even better the next day and will last for a week in the fridge. Relationships in the plant family, as in any family, can be a puzzlement at first. Given a little family background, however, many of the quirks and habits—big noses and colloquialisms in humans, scents and growth habits in plants—become clearer. And who doesn't need some downtime every now and then? 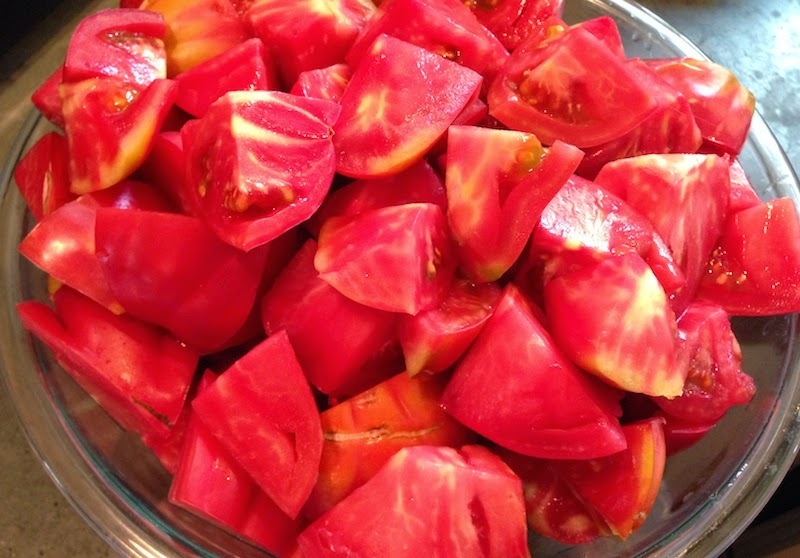 Harvesting tomatoes leaves your hands and arms covered with plant resin that has a fragrance instantly recognizable to anyone who grew up around a pipe smoker, that of fine burley tobacco. 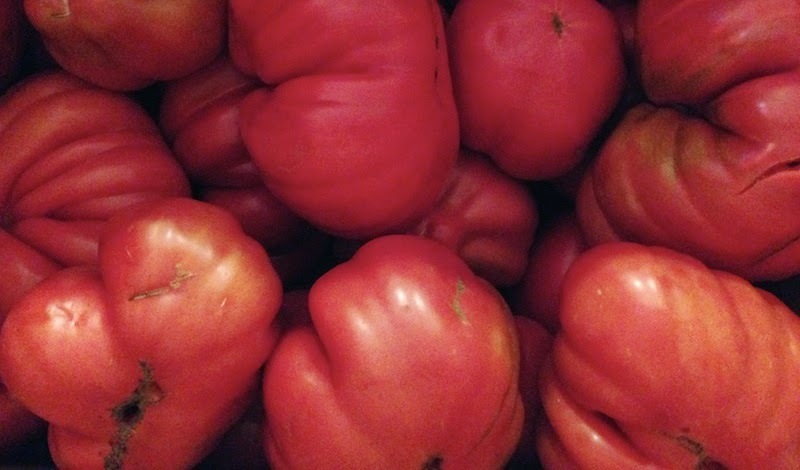 Tomatoes and tobacco, also called sotweed, are both in the nightshade family, along with potatoes, tomatillos and peppers. The Sot-Weed Factor, John Barth's novel set largely on the Eastern Shore of Maryland, refers to a traveling agent, a factor, who purchased tobacco from farmers. Like Barth, my wife Carol's father, Peter Black, had a deep affection for the Eastern Shore, both for its history, landscape and nature, as well as its natural affinity for scoundrels. His country hams, smoked and dried for seven years or more, sliced as thin as paper and served on beaten biscuits, are missed as the holidays roll around, along with Thelma Johnson's persimmon pudding and, earlier in the year, the soft shell crabs. The blue crab is of its own kind and should never be compared to its sweeter West Coast cousin. Just part of my yearly quota of astiana tomatoes from Ayers Creek. One evening, as we enjoyed the cool breeze that came down Plain Dealing Creek and through the well-placed house surrounded by old pecan trees, we talked about another of Barth's novels when Peter digressed, explaining to us the second meaning of the "sotweed factor." Tobacco is an extractive plant, feeding heavily on the land and required a seven-year rotation between crops. Thus a tobacco grower seeking to harvest an acre of tobacco a year needed seven acres total, a factor of seven. With care, other cash crops could be grown in the rotation, but building the soil for the next crop of tobacco was paramount. The farmer could grow on a shorter rotation, but the leaf lost its aromatic quality and flavor and was considered worthless. The human factor would decline to purchase it. A gorgeous, if unusual, specimen. 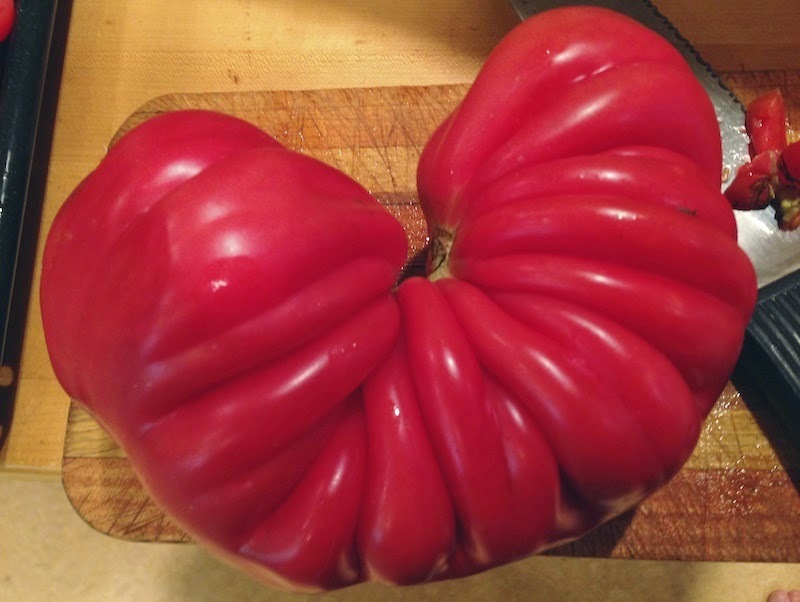 Closely related to tobacco, potatoes and tomatoes share this trait. One year, we foolishly followed a crop of tomatoes with potatoes and they were the worse spuds we ever pulled out of the ground, absolutely flavorless and unfit for our discerning customers. Diagnosing the failure, we recalled Peter's discussion about the sotweed factor, and now we make sure we keep seven years between crops in the nightshade family. Other crop plants show a similar propensity, though not as aggressive. Processors require three years between crops of sweet corn for the same reason; a shorter interval results in less flavorful corn. As a general matter, it is a good idea to separate similar crops by several years. We also heed the Biblical instruction to leave the land fallow every seven years, though we are not strictly observant when it come to the exact frequency. The fact is, land needs an occasional rest. Until the middle of the 20th century, a fallow year was included as a matter of course in crop plans. Not only does the soil rest, allowing it to refresh its mineral availability, the fallow year also creates a break in pest and disease cycles. We had an email exchange with youngish organic farmer who was growing several crops of greens each year with good success for about five years, and suddenly she started having disease problems. We recommended a fallow year. Conventional growers can address those disease and insect problems with chemicals, but the flavor and quality of the fruits and vegetables still declines with intense crop cycles. The other day, with our spuds not yet ready to harvest, we cooked up some fine looking Brand X certified organic potatoes and they were as bland as bland could be, reminding us of the nasty crop we erased with a plow many years ago. Organic growers cannot produce a good crop, even if they avoid disease and pest problems, if they insist on throttling down on the rotation and never leaving the land to rest. True, variety selection and the cultivator's competence are important as well, but they are for naught if the need for rotation is ignored. And on the seventh year, the land shall rest. 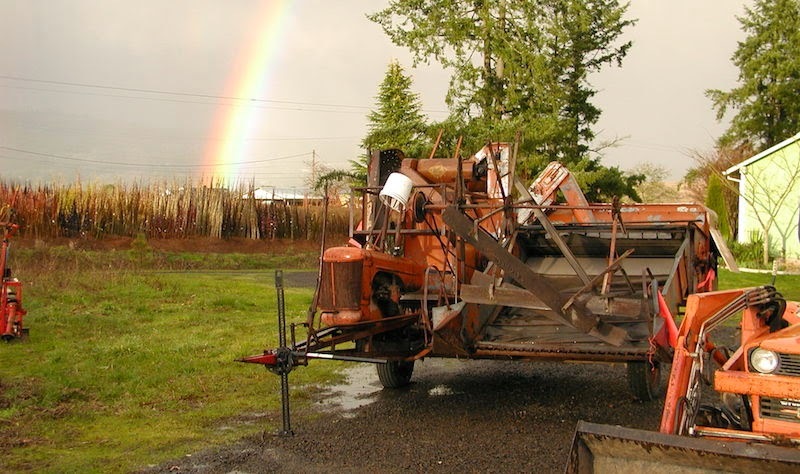 For those following the saga of the 1941 Allis Chalmers All Crop 60, Anthony has this update. This past Thursday, All Crop #67208 had her first outing in decades (the "before" photo at left…new photo to come). With the large wooden straw rack swaying side-to-side, her gait has a touch of the rumba in it. She filled bags of hulless barley effortlessly, and we should have some cleaned and at the market within a week or so. The challenge of having her ready for Will and Jon's visit was met, and Will can tell you all about this amalgam of canvas, wood and steel at the market next week. Say you belong to a CSA but you're leaving on vacation before you can pick up your share for that week. What do you do? Well, in the case of our neighbors Brian and Ed, you ask the first neighbors you run into if they'd like to pick up your share that week. Luckily for us, we happened to be the ones they tripped over first, so we got to pick up their haul (photo above) from Dancing Roots Farm, which was dropped off at another subscriber's house a few blocks away. As you can see, it's about 10 or 12 pounds of the gorgeousness that is the height of the summer harvest season, including zukes, beets, beans, broccoli, tomatoes, onions, cilantro, jalapeños and garlic. Wow! Lentils. Weren't they that popular hippie food from the 60s and 70s that were almost as ubiquitous as brown rice, and just as often overcooked? Cheap and quick, all it took was a pot of water, an onion—adding a carrot was getting pretty exotic—and 20 minutes to turn them into soup for a crowd. A pinch of curry powder in a pot of the cooked beans gave an air of the Indian subcontinent to a meal. Now, of course, we are awash in choices of lentils in the bulk section of our supermarkets: brown, green, red, yellow, French, Spanish, Italian. The other day I was browsing for ideas in the aisles of my local market and saw some good old brown lentils, but these were organic and grown in Oregon. Awesome! It was another very warm day here in the Willamette Valley—it seems like we've an extraordinary number of those this summer—and a salad seemed preferable to heating up the already overly warm house by turning on the oven. Twenty minutes on top of the stove seemed do-able, though, so I put the lentils on to cook and rummaged in the vegetable bin for ingredients. This dish was so successful, by the way, that it's now going in the permanent rotation. Plus it keeps really well in the fridge, like a good slaw improving by spending a few hours (or overnight) allowing the flavors to meld. Combine ingredients in large salad bowl. Toss. Adjust seasonings. Meandering through narrow cobblestone streets past shop windows piled with local pastries, sitting in cafés watching the locals exchange the latest gossip or exclaim over a new baby, even stopping in at a neighborhood deli to pick up fixings for a picnic lunch, it's fun to imagine what it would be like to live in the places that I visit. But when I get back home and walk into a New Seasons store or pick up fresh produce at the (year-round) farmers' market just blocks from home or meet a friend for a pint at any of hundreds of local brewpubs, other locales pale in comparison. What I loved about Liz Crain's first guide to Portland's food scene when it came out in 2010 was the diversity of the places, products and people she included. There were some of the usual suspects, the popular places and people who get featured in every travel article and guide book to the city. But it was the under-the-radar, less-traveled neighborhood stores and less well-known folks that made it such a breakthrough piece of writing at the time. On the first of September the second edition of this slim but comprehensive volume, the Food Lover's Guide to Portland, will be available, and it's packed with the same top-to-bottom listings as the first volume, but updated and expanded to include the explosion of new tastes and fresh faces on the city's food scene. From obscure corner shops like Tonalli's Doughnuts and Cream to tiny Cherry Sprout Produce to old line big hitters like Pastaworks and Stumptown Roasters, Liz has compiled a compendium of the best of the best. 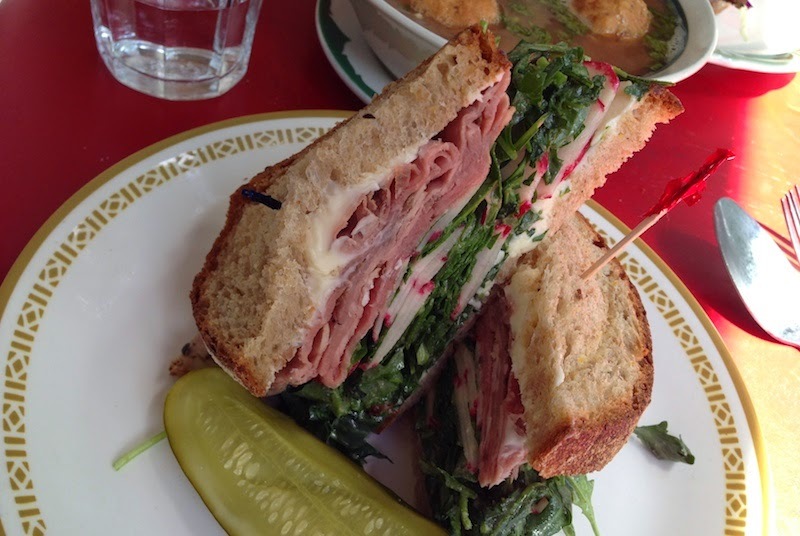 Whether you're a local or tourist, or someone who just wants to read about what a vibrant local food scene can look like, you'll find it fascinating. I sure have. 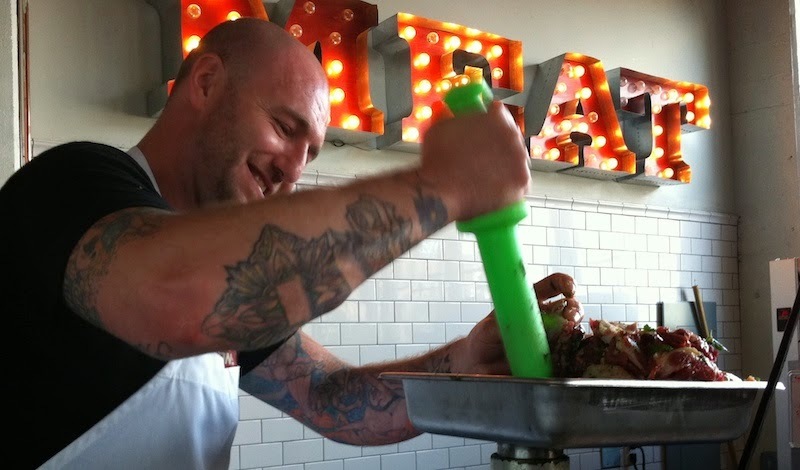 Top photo: Elias Cairo of Olympic Provisions. 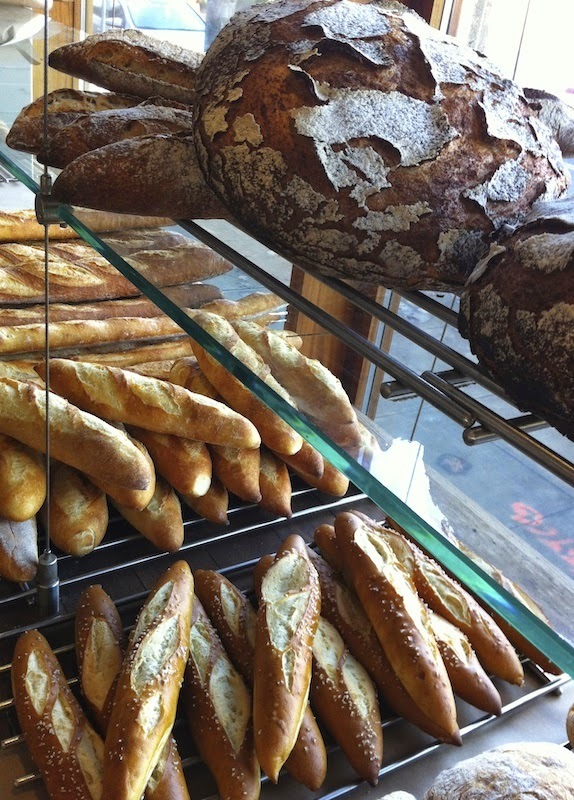 Lower right: breads at little t American Baker. Fresh corn pretty much nails it on all of my sensual fronts. Taste? Sweet and light. Texture? First the pop of the kernel, then the creaminess inside. Smell? Earthy and ethereal all at the same time. Sight? That beautiful yellow, the shine on the kernels, the juice oozing out. 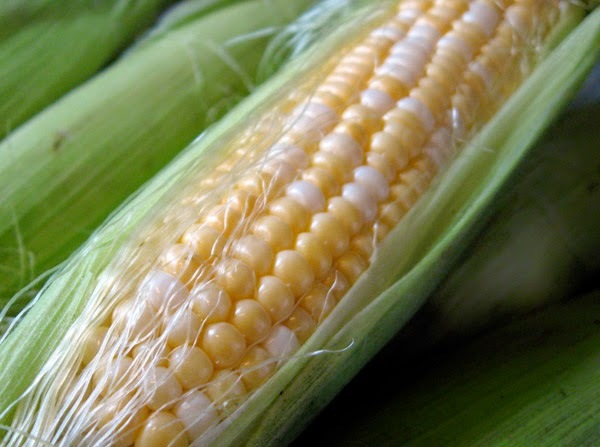 The sound might be a stretch, but I guess you could listen to the scrunching as you bite into the cob, or the popping of the kernels when you chomp down. And don't forget to use those stripped cobs, yes, even the whole ones that have been served to your family, to make a corn stock to make soups and risottos. Throwing them into the compost without first boiling off the juices is now, for me, akin to throwing out a fish carcass without roasting it for the meat left on the bones. And while it's terrific fresh, I've always got a few bags of frozen kernels stashed away in the freezer from this most fleeting of summer pleasures. 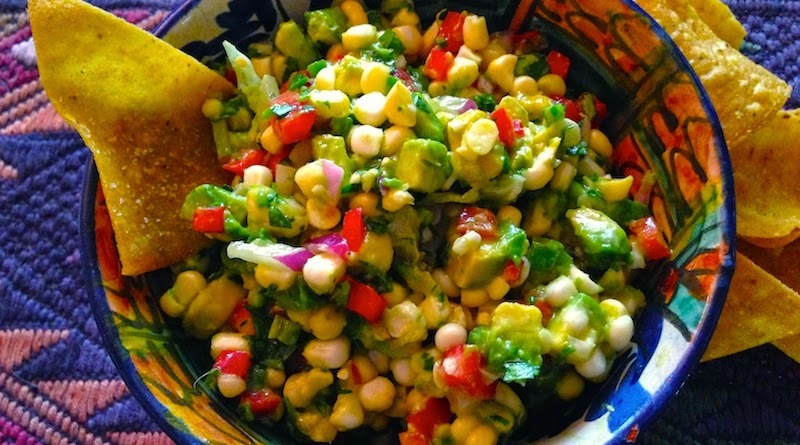 The following recipe for corn salsa is almost a salad by itself, but is also great with tacos and Mexican-inflected dishes. I think it would be fabulous with grilled fish, too. Place ingredients in medium mixing bowl and gently combine. Once upon a time your neighborhood market was a little mom-and-pop place where neighbors could pick up a quart of milk or a loaf of bread and their kids could stop in with a dime and buy candy. The owners would often live above the store and their kids went to school with your kids. Those small businesses eventually disappeared with the advent of so-called convenience markets like 7 Eleven and Plaid Pantry that were packed with snack foods, sodas and cigarettes and weren't the sort of places you wanted your children hanging out in. Now small markets are popping up in neighborhoods again, stocked with dry goods, milk, cheese and bread, some even featuring a café with a deli and homemade soups and sandwiches. 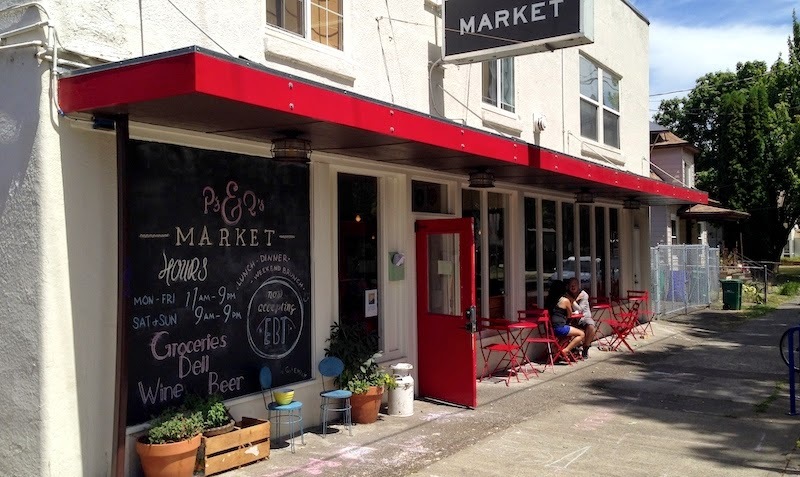 Ps and Qs Market, in the DIY spirit that is taking root and growing a new business district in Northeast Portland's Woodlawn neighborhood, is a shout-out to those little stores of yesteryear. Open from lunch through dinner, with the requisite weekend brunch hours, these two are no babes in the woods. Anderson came from managing Bryan Steelman's ¿Por Que No? and Davis cooked for years at various small restaurants around town, Bröder and Podnah's among them. With light pouring into the space from the big windows on its face, the front is the coffee shop and deli where residents can grab a cup of joe and share the latest gossip over a pastry or sandwich. The bulk goods, produce and large refrigerated cases of milk, cheese and other fresh items line the side and rear walls, with the bustling open kitchen and service counter taking up the center of the room. Our lunch there was on a quiet day, with neighbors stopping to chat and pat the heads of children and dogs, an unshackled bicycle leaning casually against the building. We shared soup (a Latin-inflected tomato-and-bean with corn dumplings) and a couple of sandwiches (pulled pork for Dave, rosy house-roasted beef for me). We sat outside in the shade of the awning, feeling like this little bootstrap of a market is just the kind of place that makes our city a good place to live. Which includes the local kids who stop in for red vines for a dime. 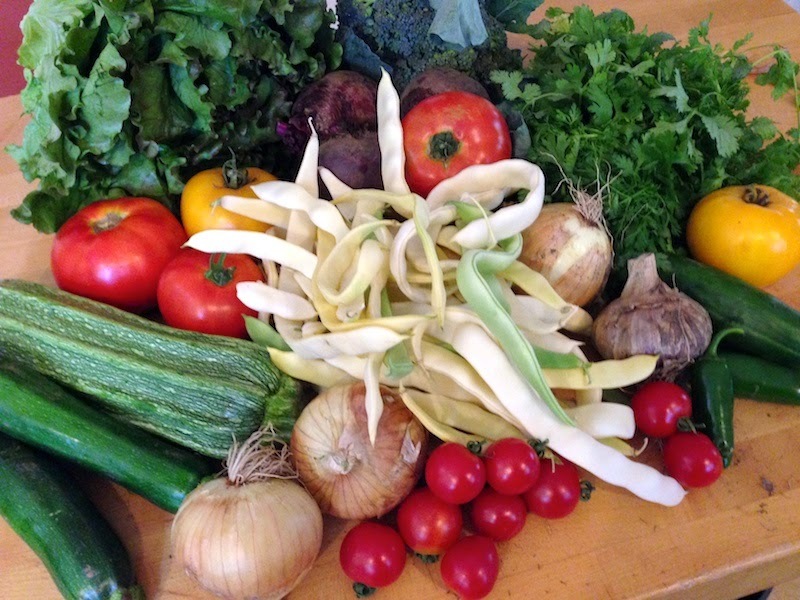 Details: Ps and Qs Market, 1301 NE Dekum St. 503-894-8979. 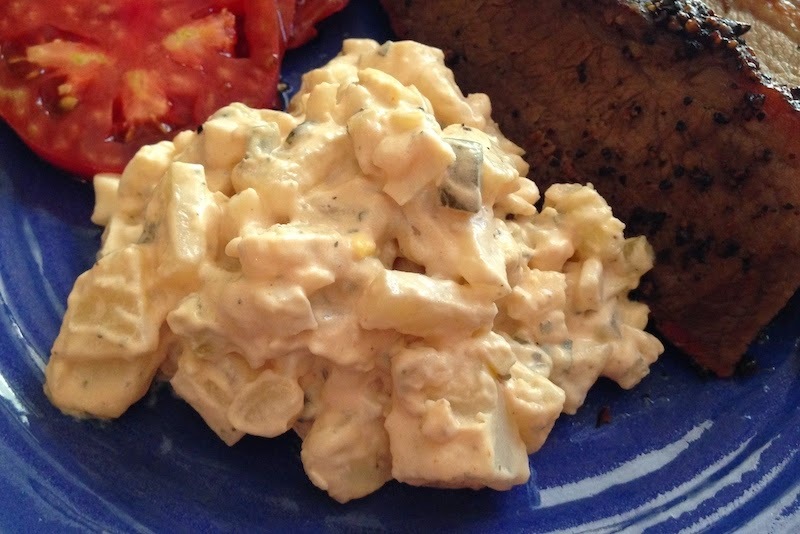 Contributor Jim Dixon of Real Good Food shares his recipe for a main dish potato salad. I can say it's definitely going to be making an appearance on our dinner table soon! 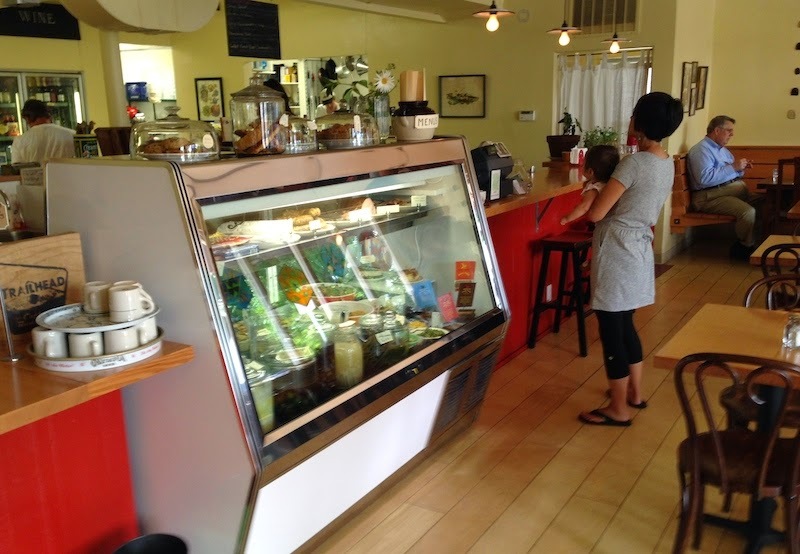 Oregon albacore tuna is in the markets right now, and so are Walla Walla Sweets. And they taste great together in this potato salad. Have your fish monger cut the skin from an albacore filet (annoyingly called a "loin") and slice the fish into steaks about an inch and a half thick. Warm about a quarter cup of extra virgin olive oil in a skillet over low heat and gently poach the fish, turning frequently, for about 10 minutes. When the tuna turns white, turn off the heat, cover the pan and let it sit for about 20 minutes. Steam or boil 2 or 3 yellow potatoes; when easily pierced with a knife, let cool and peel. Cut in to bite-sized pieces, place in a large bowl, and toss with about 2 tablespoons of Katz Viognier Honey vinegar. Thinly slice a Walla Walla sweet onion and add it along with the poached tuna and the olive oil used for poaching. Pick the leaves from 6 or 7 parsley sprigs and chop. If you have any in your garden, chop about the about the same amount of lemon verbena leaves; if you can't find verbena, use fresh mint. 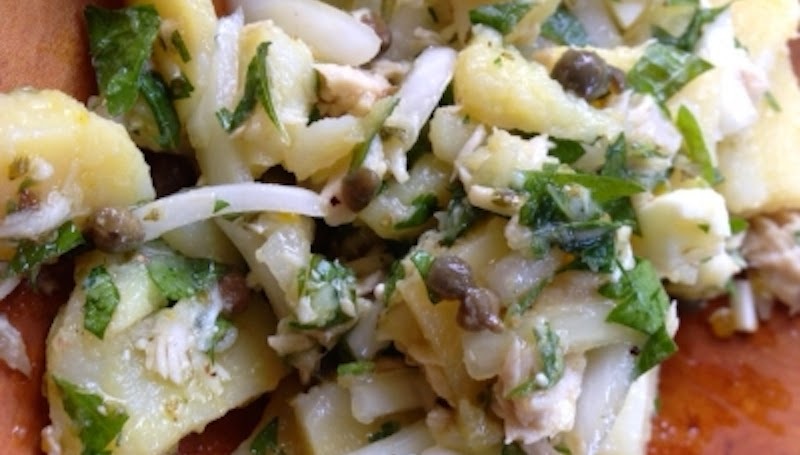 Soak a couple of tablespoons of Pantellerian capers* in cold water for 10 minutes, then drain and chop. Add the capers and herbs, along with a good pinch or two of dried Pantellerian oregano*, to the tuna, onion, and potatoes. Drizzle with a little more extra virgin if you feel like it, sprinkle on some flor de sal, grind in a little black pepper, and eat. * These products from an island off the coast of Sicily can be substituted with regular capers and oregano. For the real deal, though, go to the Real Good Food website for purchasing details. We have been caught in the riptide of the season where the harvest of the Chesters continues apace and we are sowing our winter crops. Hence less prolix than usual. The seedling chicories, including our first re-selection of the late Treviso type, are emerging. Barely visible, they show up as a thin green line when viewed down the row rather than as individuals. To make up for last year's disaster, we have doubled the planting, such is the thing of a farmer. Into this mix, we are restoring a 1941 Allis Chalmers All Crop 60. We dragged it home ten years ago and we have tackled the project bit by bit, with progress measured in its disassembly. Our son-in-law and his kid are visiting in late August, and the goal is to have it up and running by then. Otherwise we won't have chickpeas and barley this year. Every restorer's nightmare, nurtured by the hapless coyote in Roadrunner cartoons, is that a single bolt is forgotten and, upon starting, the machine collapses into a pile of rubble. If it is oddly missing during the Ramble*, that is what happened. * This year's Ayers Creek Farm Ramble is scheduled for Oct. 12. Details to come. Just to remind you, as if you didn't know already, that we are in the height of farmers' market season in Oregon. With more than 60 markets operating every day of the week around the metro area, and many, many more around the state, it's time to get out and taste the goodness that our farmers are growing for us. The bounty above was from one of Portland's newest markets, the small-but-mighty Cully Farmers' Market on NE 42nd Avenue next to Old Salt Marketplace. Amaro Brothers Produce is a new vendor at this market, and along with potatoes, eggs, tomatoes and corn, they bring terrific Latin specialties like peppers, squash blossoms and herbs. Because of our richly diverse market scene, small farmers like the Amaro family are able to sustain themselves by selling directly to customers and not be beholden to distributors. 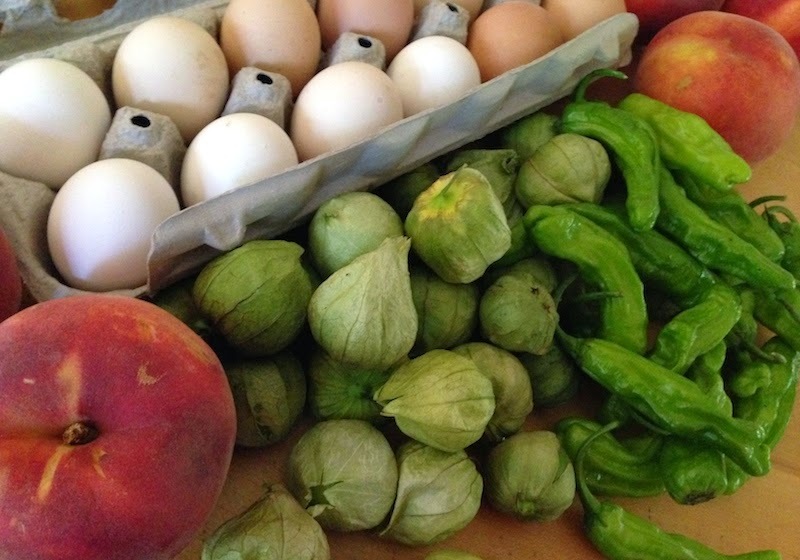 So get thee to a market today, and don't forget to thank these folks for their hard work. Find a market near you on this list of Oregon's farmers' markets, including links, maps, addresses and hours of operation. Really great Chinese food. A brewpub with a menu that ventures beyond pizza, burgers and fried food. An East Coast-style diner. All in short supply in food-mad PDX. But the diner, that fixture of Americana with stools lining a counter and booths predominating over tables, may have just reappeared on a moribund corner of downtown. Formerly Leo's Non-Smoking Coffee Shop and before that a series of greasier-than-greasy spoon luncheonettes parked behind the Central Library on SW 11th and Taylor, it was bought and reimagined as a "finer diner" by Dayna McErlean, she of the revitalized corner of NE 30th and Killingsworth's Nonna, DOC and Yakuza. Hiring the whiz-bang wunderkind Claire Miller, known from her magical touch in the kitchen at Ben Meyer's Grain & Gristle, to run the kitchen at Dime Store was a stroke of genius. Claire, if she'd been born a few decades earlier, would perfectly fit the bill as the sassy proprietor of a classic 50s diner, cigarette dangling from her lip, slinging hash and bon mots at her regulars while feeding them food their mothers would approve of. Though smoking has gone out of fashion (thank heavens), Claire's menu couldn't be more of a throwback to the days where everything in your favorite diner was handmade from quality ingredients. Breakfast is chock-full of items like granola, flapjacks, home fries and biscuits. 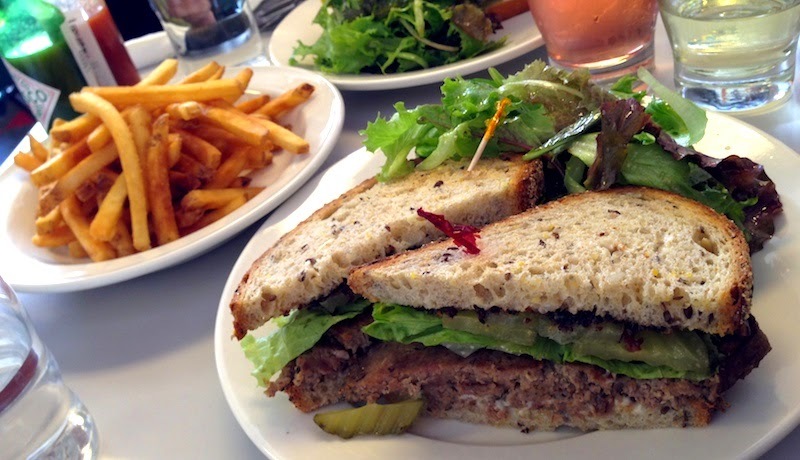 Lunch features a meat loaf sandwich to die for, a burger of house-ground beef and a selection of desserts that look like they came from your grandmother's kitchen. Portland hasn't seen a place like this since the days of yore when the late, lamented Shakers Café took the nascent and as-yet-unbranded Pearl by storm. Let's hope that Dime Store gets the same attention, because this classic is worth keeping. 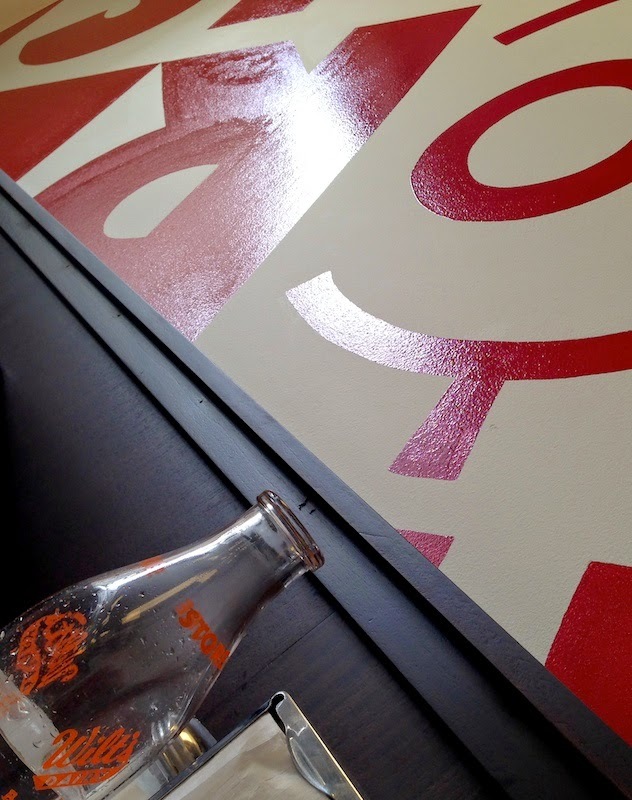 Details: Dime Store, 837 SW 11th. 503-228-1866. The last thing I wanted to do was turn on the stove when the temperature hit 90 degrees for the fourth day in a row. The house was already uncomfortably warm, and even with the AC unit in the upstairs window cranking on high and fans buzzing all over the house, the effort to create something like a wind chill effect felt more like a sirocco on the Sahara. I could tell that crankiness was right around the corner, so taking inspiration from Mark Bittman's article on gazpacho in the NYT, I decided to turn that sweaty frown upside down with a chilled vegetable soup. Eschewing the idea of steaming or sautéing anything beforehand, I decided to try my luck with raw ingredients. A minimum of chopping, a bit of time in the blender and dinner was ready. Very refreshing served with sliced heirloom tomatoes and a dry white wine, I was almost able to imagine myself dining poolside in the tropics. 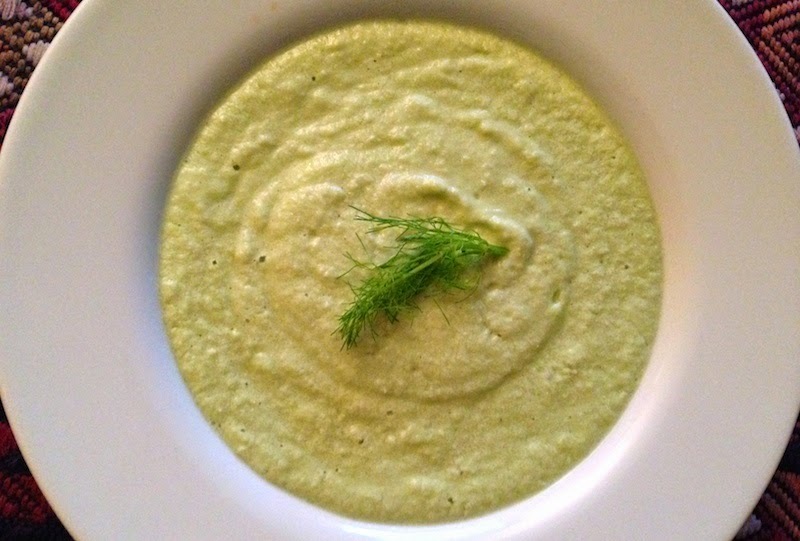 Place half of the cucumbers, avocado, fennel bulb, onion, garlic, lemon water and sour cream in a blender. Blend until mixture is thoroughly puréed. Add half of bread cubes and continue to blend until it is a smooth mixture. Add salt to taste. Pour into large mixing bowl. (At this point you can taste and adjust amount of onion, etc., for the other half of the soup.) Repeat with second half of ingredients. Stir to combine. Can be refrigerated (or not) before serving. Once we arrived I didn't want to leave. Go to the store to pick up an item in the nearby town of Zigzag? No, thanks. We could make do with what we'd brought. Even leaving camp to go on a hike seemed like a bother. I'd rather just sit in a chair on the porch and read a book while listening to the river clattering by, its white noise blocking any intrusions from the outside world. 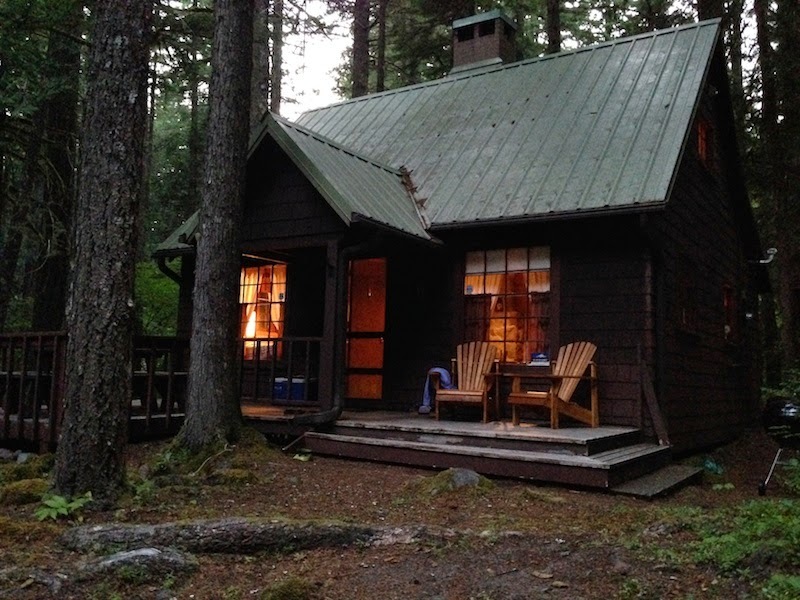 The rustic cabin, owned by friends who generously shared it with us, had been built as workers' housing in the 1930s by Civilian Conservation Corps crews working on projects around the newly designated Mt. Hood National Forest, including helping to build Timberline Lodge. Built from fir that was no doubt milled from trees harvested nearby, and with door trim, bannisters and railings handmade from small trees, the cabin's main feature is a large stone fireplace, around which the downstairs living room and kitchen and the two small upstairs lofts were arranged. A family had owned it for the past 30 years before our friends bought it—in fact, you purchase just the structure, while the land it sits on is owned by the United States and is managed by the Forest Service—and it was sold complete with furniture, curtains, silverware, everything. Including a display of plates on the header over the sink. There is an annual tour of historic cabins designed in the early 1900s by the idiosynchratic Henry Steiner and his sons coming up on Aug. 9th that would be well worth the $20 ticket price. And if you're interested, you can read more about what's involved in owning a leased land Forest Service cabin.